Sorry the above is all tossed up, I was too busy eating to remember to take photos - this was good - fresh, slippery bits of chicken (maybe too "bitty" for some, especially if you don't like bones). 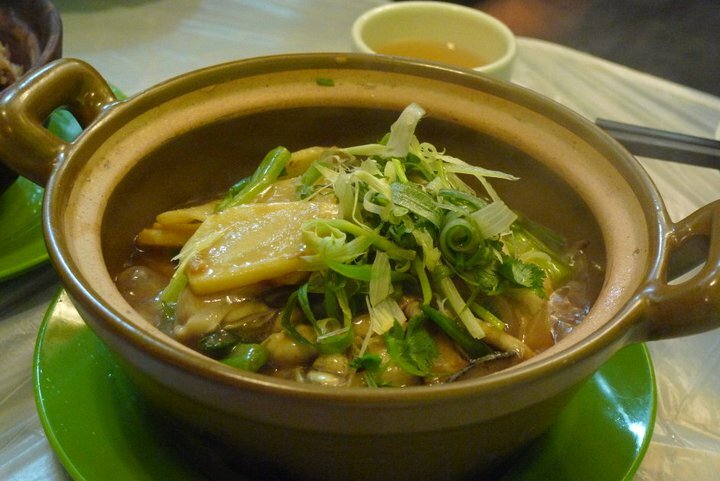 The opening pic is of a "white" eel claypot rice. The sweetest, fattiest eel I've had in a long time that isn't just all suicidal hair-like bones and no meat. And not just any meat, I meant it when I said it was sweet. Pretty sure it's seasonal, but if they tell you this is available, have it. Don't think, just start plucking bones. The turnips underneath the brisket rocked my world. Turnips in general rock my world, but this subtly sweet, clear soup with tender chunks of translucent turnip was just amazing. The thin slices of brisket were fall-apart soft too. 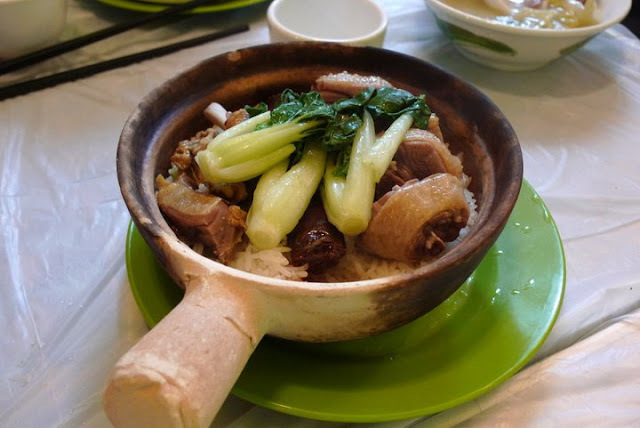 The flavours are light compared to some other slowcooked beef + turnip combos (think Kimberley's lemongrass beef) so don't come expecting that. It's a totally different experience. One that feels almost as healthy and as nourishing as my mom's herbal soups. The little curved metal sheet things are the individual stoves for the claypots. The dude tilts the claypots ever so slightly in different directions every so often. 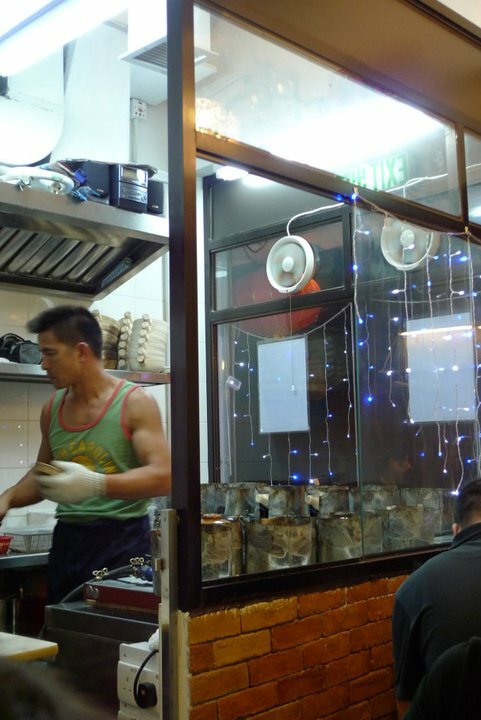 These oysters were a special that night, and they were huge meaty bad boys. I would have liked it with less sauce, like the way Manor does it, but this was still tasty and the oysters were a little undercooked, so there wasn't that weird graininess. Instead it was still slippery like raw ones, except slightly firmer and seemingly denser. The ginger did a good job of easing us into the metallic marine-ness of the oysters. 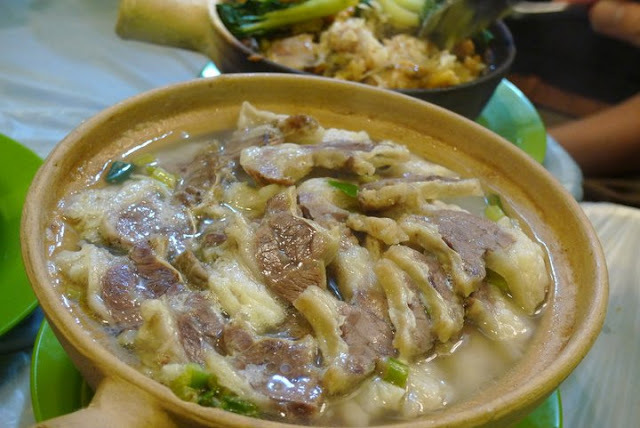 Waxed duck and yun cheung are both typical winter dishes, and they're pretty heavy (especially the yun cheung). 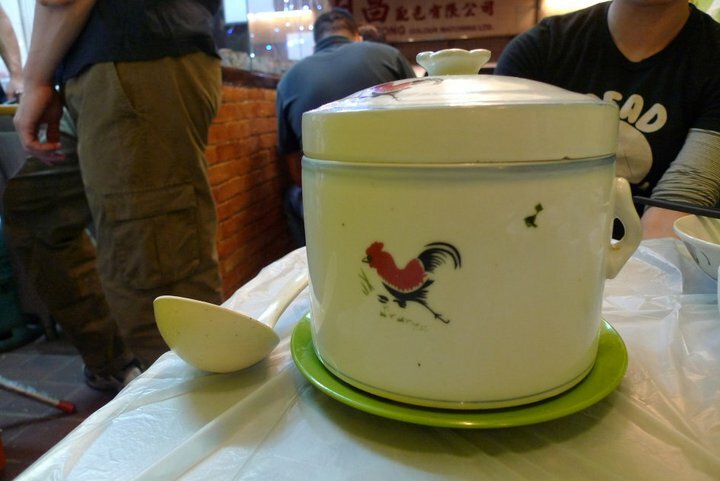 I think they're put into the claypot when the water in the rice just starts to boil. The fats from the duck and the sausage both melt into the rice, giving it an awesome, salty, meaty slick of oil that penetrates right to the bottom of the claypot, so when you hack at the last bits of crisped, slightly burnt rice at the bottom, you get a good bit of fat too (but not so much you feel sick). It's like duck fat rice crispies. 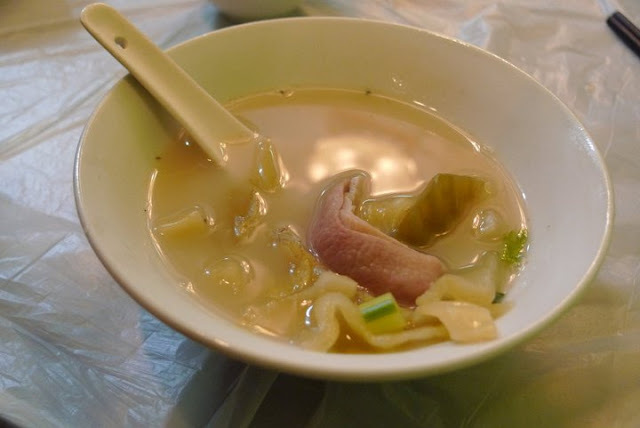 I love Cantonese soups, though strictly speaking I'm pretty sure this is a Chiuchow soup. 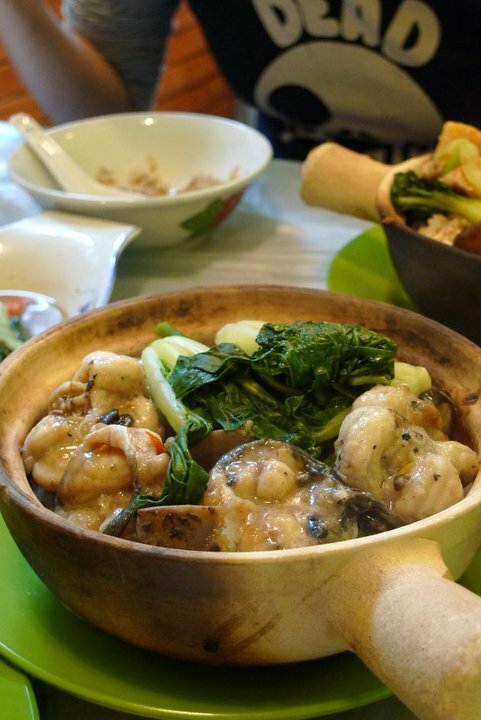 Really peppery with the juicy twang of vinegared mustard greens and the richness of pork soup. It's a bit of an acquired taste (like a lot of Chiuchow food) but if it's your cuppa, this is just perfect. Not everything is available every day; in fact I believe a lot of the dishes are seasonal so either ask when you book (and you must book, unless you feel like waiting for an hour) or once you sit down. Duck fat rice krispies.........if only they had that in the breakfast aisle. And I was just telling someone today how I missed the food in HK... I love the crispy rice on the bottom too. hello, may i know how to get to this place? near causeway bay? Rachelle - haha indeed! It certainly won't have that "heart" logo saying doctor-approved on it though. Claypotclub - your handle is fantastically fitting. 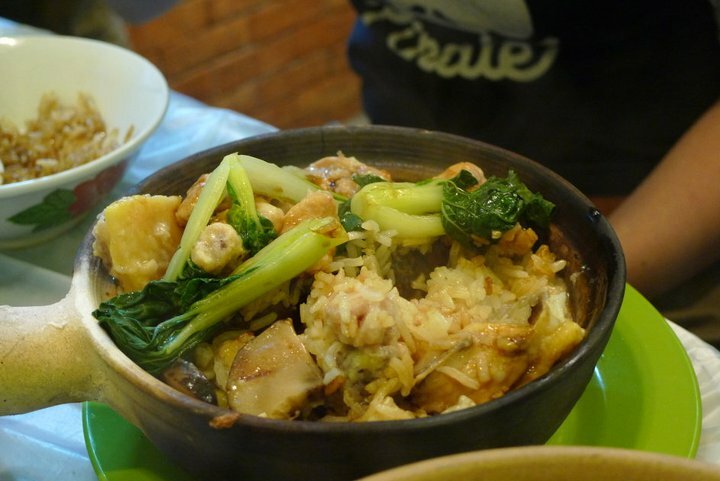 Have you tried making claypot rice at home? Anon - if you're taking the MTR, get off at Tin Hau, then it's a 10 minute walk. You can click on the map in the post for a larger map or zoom in/out.